The new leaf growth on my Jalapeno pepper plants are tiny and then fall off. Why would this happen? 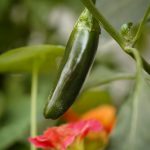 I've done some research online to determine why the new leaves on my Jalapeno pepper plants have sprouted out, grew a tiny bit, and then die and fall off. I don't see any examples of my situation anywhere. The older leaves are fine and have no visible issues. They don't have bugs that I can see. I water them regularly and to one of the waterings I add a bit of Epsom salts to the watering can. I have 2 plants in one large pot and the other plant is not having any issues. Any help/advise you can give will be greatly appreciated! I have attached a photo of the issue. Please help. I would love to remedy the problem, if possible! An American living in Japan. Thanks for your response! The only thing is that it's not only the buds that are falling off. About a month ago, I read the article you suggested in your response. My plants were all growing fast and flowers blooming. But, every single one would fall off. I then realized, after reading that article, it was due to the heat wave we had this summer. It was in the mid 90's for a long time, with the heat index over 100. But, the last month has cooled down into the 80's and the buds no longer drop off. In fact, each plant has many many new fruits growing. I pollinate each flower myself as we don't get many pollinating insects on our balcony. If you look closely (zoom in) at the photo I attached to the original question you can see just the top of the plant looks wilted and has a little bunch of "dead-ness" at the top. It's definitely little leaves/buds that started to grow but then just stopped, dry up and fall off. And, each morning there's little dead leaves on the floor. I have now noticed that 2 of my other plants (in other pots) are starting to do the same thing. I have 8 plans total. All of my plants have many many peppers growing and tons of buds flourishing. It seems to only be any attempt of the plant to grow new top greenery. Is there any specific deficiency that might cause this? I give them miracle grow for vegetables once every two weeks, and they are watered daily. Being in pots in temps in the 80's, they tend to need it. Is there a way I can send you some better photos of this plant? Viva Los Peppers! Ha Ha!